Pick up from your hotel at 8am. Drive 45 mins. to the south-west of Chiang Mai. Arrive at the elephant camp and ride on the elephants for approx. 1 hr. Drive on to a Karen village, where we start a 2 hr. hike through the forest. We pass a number of waterfalls on the way; you can cool off with a refreshing swim. We end up at a Karen village, where there's time to rest and explore. Lunch is had along the way or at the village. After exploring the village walk for 1 hr. to the pick up point, and then drive to the start of the rafting trip. Travel down the river on bamboo rafts for approx. 1 hr. Then drive back to Chiang Mai. Our popular 2 day trek to the area north of Chiang Mai. This is a fairly easy trek and the route can be altered to make it a very easy trek if travelling with children or older people not used to hiking. Highlights = elephant riding, rafting & Chiang Dao Caves, as well as hiking in the hills around Chiang Dao and meeting the Palong tribe. A good trek for anyone who is not fit, and as it's a private trek you can stop as often as you need. Our popular 2 day trek to the foothills of Doi Inthanon Park - south of Chiang Mai. A fairly easy trek with nice scenery and an excellent location for bamboo rafting. Highlights = elephant riding and rafting, as well as hiking through the foothills of Doi Inthanon and seeing the Karen tribe. A good trek for anyone who is not fit, and as it's a private trek you can stop as often as you need. Our popular 3 day trek into the hills of Chiang Dao to visit mainly the Palong and Karen tribes. A good trek of moderate difficulty with many trail options for harder and easier hikes. Day 3 Walk for approx. 2½hrs. to the Ping River and stop for lunch. The morning's walk is mostly an easy hike and nice and relaxing. We then meet our transport and drive the short distance to the rafting point. After lunch, board the bamboo rafts and cruise down the river for approx. 1½-2hrs. Then drive back to Chiang Mai (approx. 2hrs). Our new program - trekking to the Doi Inthanon National Park for 3 days to enjoy the great outdoors with great views. Highlights - Doi Inthanon National Park and its wonderful views and forest, as well as Karen hilltribe villages. 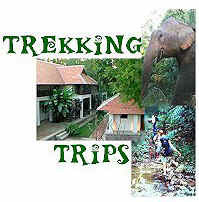 Chiang Mai Trekking Trips - choose from one of our custom designed Chiang Mai Trekking Trips. We have put together packages of accommodation, trekking and tours. We pick you up from the airport or train station and take you back at the end of your trip. Simplify your trekking holiday in Chiang Mai - all you have to do is enjoy and relax. Copyright © 1998-2005 Wayfarers Travel All rights reserved.